This Saturday we're setting sail on Royal Caribbean's Empress of the Seas, and while we're excited to sail on Royal's smallest ship in the fleet, we're even more exited about our itinerary which takes us to Havana, Cuba! We'll also be visiting Key West and Cozumel, places we really enjoy, so this should be a treat. During our five night sailing we'll be blogging at EmpressOfTheSeas.live, for RoyalCaribbeanBlog.com. Be sure to follow along on the site, and stay tuned in on Twitter, Instagram, Facebook, and of course Periscope. Oh, and make sure to catch Michael Poole's live blog from Oasis of the Seas going on at the same time as mine. Mine is sure to be superior in every way, though if you dig photos of anything that happens before 9:00am you'll want to check with Michael's posts. Now, let's start of by looking at our itinerary, the ship, and why we picked this particular sailing. This sailing is round-trip from Tampa, FL, and in fact, it is the first 5 night Tampa sailing to visit Havana, having recently reallocated from sailing out of Miami. Some of the times in port are a bit different than what we're used to and I'm not sure how much of this is because we're coming from Tampa, the routes were taking, or simply what port times were available. Either way it'll be neat to be in Key West and Cozumel a bit later than normal, even it the total amount of time in port isn't any different. Because we're sailing from Tampa, but we live in the Fort Lauderdale area, we're going to come into town the day before. We're staying at the Tampa Marriott Waterside Hotel and Marina, which is steps away from the port. This will keep us in the area to enjoy an evening of catching up with some friends and should make for a much less stressful embarkation day. For Key West I'd imagine we'll again leverage Old Town Trolley, which I really enjoy as it's a cheap way to get around town easily with narration. We've been here a number of times so I don't know we'll have any big goals on our visit, aside from going to Peppers of Key West and stocking up. The sun is scheduled to set at 8:07pm, so we won't quite get Key West at night, but the sail-away should be beautiful (let's hope for the cruise pier, not the Navy pier). In Havana we're taking a tour through Royal Caribbean called "Hemingway's Havana". The tour says we'll, "Explore the literary connections between Cuba and the late American novelist Ernest Hemingway on a dynamic four-hour tour that offers the chance to see where he lived, fished, dined and sipped his favorite cocktails." I'm going to assume this means drinks will be served - right? The four hour tour will have us up earlier than normal but we'll want to take advantage of every moment we have in Cuba, so it'll be worth it. After this we're going to meet with a friend's relative who lives in Havana. Cozumel has become a very familiar port to us over the years, and in a weird way it feels like a second home. We're on a first name basis with some restaurateurs, know where to find what we want in the supermarket, etc. No real plan here, but you can be you'll find us at Coz Coffee at some point. Empress of the Seas used to be called the Nordic Empress, and she's actually Royal's oldest ship, originally sailing in 1989. She left to sister-company Pullmantur some years ago, but was completely redone in 2016 and brought back to Royal Caribbean specifically to sail to Cuba. She's also Royal's smallest ship, at just 48,500 gross tons, carrying a maximum of 1,840 passengers (with all berths full, including uppers/bunks) and 668 crew. In contrast, Harmony of the Seas is 227,000 gross tons and carries a maximum of 6,780 passengers and 2,300 crew. If you're a frequent reader/viewer/listener or receiver of my telepathic signals, you'll know that I'm partial to what we now consider smaller ships. Have I enjoyed my time on Voyage, Freedom, and even Oasis class ships? Of course - they have so much to offer! I like knowing I'm at sea though, and this can be tricky on mega ships (though I'm hopeful that this is changing with newer designs). Beyond this, there is just something about the intimacy of these ships that I love - something we got spoiled with when we sailed Oceania's 30,000 gross ton Regatta to Alaska in 2015. Take a smaller ship, which we've not sailed but has been recently refurbished, and send it to a port we've been waiting to visit and you bet we chose Empress of the Seas. Obviously Cuba is the influencing factor for this trip, but why this particular sailing? When Royal Caribbean opened up it's Cuba sailings and I saw the prices I knew they were going to climb quickly, so I booked right away - and I'm glad I did. In fact, about a month before we leave, the cost of our same stateroom category had doubled. Remember to book early and re-price often. Further, we looked the Norwegian Sky, as she too goes to Cuba, but the prices were much higher than we we snagged on Royal Caribbean this time. I did have several to chose from though, and while it would have been nice to sail from Miami (much closer to home), this sailing was a bit cheaper than those leaving from Miami, and we needed to sail over the weekend to save vacation time (gotta reserve it for more cruises, of course). Several months ago Royal Caribbean did release some more itineraries where Empress was overnighting in Havana, and this sounded amazing. The prices weren't bad, but every one of these sailings was Monday through Friday, and to be honest, I can't get myself to take five days off work for a five night cruise when I could take five nights off for a seven night cruise. Oh, there was one more consideration - the Tampa sail-away. 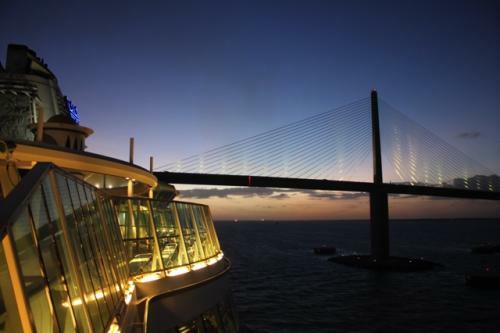 I've seen many great videos of cruisers leaving the Port of Tampa and sailing under the Sunshine Skyway Bridge, it looks beautiful. 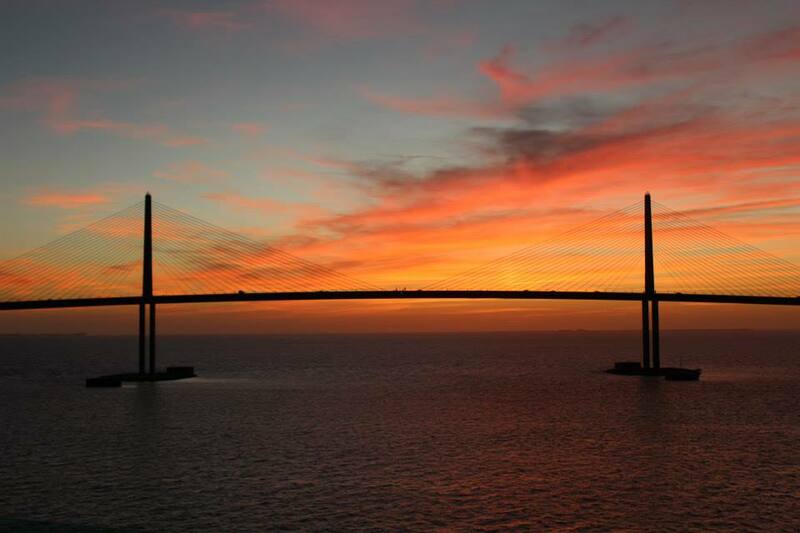 So beautiful that we booked a sailing out of Tampa before we knew we'd be taking this cruise - just so we could enjoy that sail-away. We've since changed that other sailing, scheduled for early 2018 so sail the Celebrity Equinox instead. As you can tell we've got some special reasons to be excited about this sailing, and hopefully it will be the first of many cruises to Cuba for us. If you're planning a cruise to this island nation however, know that there are some additional considerations in terms of changing money, keeping in touch, travel restrictions, etc. Check out CruiseHabit.com's Cruising Cuba series to get clarity on these topics and reach out if you have any questions. We'll see you in a few days from Empress of the Seas! Have questions? Have you cruised to Cuba and have any tips to offer up? Let us know in the comments below! Well friends, it is day 5 already, these shorter cruises just go by so fast. Today I planned to enjoy Empress of the Seas, but try to do something different activities. I woke up and saw that the Oasis of the Seas was actually sailing beside us, so I ran up to the top deck to check her out. We both traveled back home together for most of the day. At 10AM they were doing Royal Caribbean trivia in the Schooner Bar, they had some pretty hard questions, I was surprised. I learned that Empress has the largest Schooner bar in the fleet, which I always thought it was Majesty. After the trivia game I had been invited to the Galley tour for being Diamond Plus. This was my first Galley tour on a cruise, so I was very excited. The Galley was actually quite smaller than I thought it would be, but everything was so clean. Royal Caribbean spent $20 million building this new galley during the Empress dry dock. In the tour I was able to see the Chops section and they were working on the shrimp cocktail for the evening so that was pretty neat to see. They did prepare a special lunch for those on the tour, but I decided to skip it and head to the pool deck. The pool deck had really come to life today; I haven’t seen it like this all cruise. Everyone was just enjoying themselves and their wasn’t a cloud in the sky. I watched the belly flop contest and it was quite entertaining. The assistant Cruise Director hosted the party and she did a nice job, she tried to create a dance party after the game. However, the ship had to turn around due to a floating man-made raft out in the ocean. This caused everyone to run over to the side of the ship to look over; thankfully no one was in the raft. Great job by Royal Caribbean for turning the ship around to make sure it was clear. After we received the all clear from the raft, I decided to grab some lunch in the Windjammer. Today I went with chicken wings and ribs, almost like being in Coco Cay. I have never seen chicken wings on board before, so this was new for me. Once lunch was over I thought it was time to start packing up the cabin. This is never as much fun as packing up, but I like to do it early so I can enjoy my evening. Tonight, I decided to go see the show, I know that’s two shows this cruise! The show was outstanding! The theme was past, present, future and a Las Vegas themed show. The show only last 35 minutes so it was a nice short activity before dinner. I’m very happy I went and highly recommend the shows on Empress. For dinner, it was back to the Windjammer for a quick meal. Again the place was pretty empty but almost 8:30pm, so perhaps most people eat earlier. The options for dinner were a little different tonight; I went with pasta and fish. They had a large cake for desert that said, thank you for sailing with us, I passed on the cake. After dinner, I went to the Viking crown lounge and it was pretty full, everyone taking full advantage of their last evening. I just enjoyed one last drink before wrapping up my last day. The Empress of the Seas is a great value for those looking for a quick getaway. The ship on the inside feels very new in parts and older in others. She is a very relaxing ship, so if you enjoy a slow paced cruise this is for you. All the crewmembers get to know you, I think just about every one of them knew my name when they saw me. The cabins are small, so just be ready for that but not a deal breaker for me. I was able to peek into an Owners Suite to take pictures. The Voom high speed Internet worked great, I never had any issues with it. From in my cabin to the pool deck it was fast Internet. The staff was very friendly; they are trying so hard to create a good experience for the guest. Thank you so much for following along this week, it was a really fun cruise! Until next time, I’ll see you at sea! Good morning from beautiful Cozumel, Mexico! It is always a great day when you are in Mexico and the weather could not have been better. Last night I was thinking about not having any plans in Mexico, so I booked Nachi Cocom on my phone. They do require you to bring the printed confirmation email, so I asked the Loyalty Ambassador to print it for me. The cost for the all-inclusive Nachi Cocom is $55 per person. This covers all the drinks & food you want, but you still need to get transportation to and from. The cost for a taxi is $17 (up to 4 people) per way and you can usually just share a ride back to cut the cost in half. I knew the Oasis of the Seas was coming to Mexico today too, so I wanted to get up to make sure I could watch her dock. I guess I should add that the Empress of the Seas was docked beside the Oasis of the Seas today. Let us just say we did not even come up halfway on the Oasis, but that is okay Empress is just perfect. I was able to take some pictures of the two of them together. There were five ships in port today, so the lines for a taxi were long. I also saw some competition going on with runners and bikers, not sure what it was but they had people from all over the world. My taxi ride was a van with another family they were going to Mr. Sancho’s so we stopped there for a quick dropped off, then Nachi is right beside there. I was greeted to take my photo and was showed to my seat. I got there around 9:30am, but they are on central time, so bar service did not start for an hour – I know the struggle is real. My afternoon at Nachi Cocom was very relaxing and they did not have very many people here today, which surprised me with the number of ships in port. I had them bring me some guacamole down to my beach chair for my pre-lunch. I went up to sit in the hot tub for a while to enjoy the swim up bar and made some new friends. For lunch I went with shrimp fajitas and well more guacamole. They can either bring it down to the beach or you can eat it up by the entrance with tables and chairs. When you look at their menu, you will see prices on everything, not sure why they are there but just order away it is all included. I decided to head back to the ship at 3pm just to avoid getting close to that all on board at 4:30 time. Of course since we were in Mexico we had a family of 5 that was running late. The Captain made an announcement that we would wait 5 more minutes. Sure enough 2-3 minutes later they were running down the pier to get back on board, they were lucky we waited. Tonight, I was feeling sleepy all ready from all that sun in Mexico. I went casual again for dinner in the Windjammer. It was not my favorite meal again, but fine for a quick dinner. I have noticed at dinner they are only using about half of their set-up and it is always empty. I had grilled fish and french fries, got to love that combo. After dinner I went out to the pool deck and they were showing a movie. At the bar they were selling popcorn for $2 a bag for the movie. The pool was empty and a man was cleaning down in there. I tried to take photos of this for the blog but a bartender rushed over and said no pictures or video, this was a first for me. By around 10PM I decided to call it a day, all those drinks in Mexico and sun had me beat for the day. Tomorrow is our last day, we have another sea day and I have a few new things planned to share! Today was my first sea day and I was really looking forward to it. I did manage to sleep in until 8AM, if you call that sleeping in. I did not have many plans today other than just enjoying Empress. On Empress of the Seas they have a brunch on sea days in the main dining room, from 10AM-1PM. This is something you do not want to miss because they also serve free Bloody Mary’s and mimosas. Yes, you read that right, free drinks! The options for food are also very large, from made to order omelets to grilled salmon. The brunch is something you do not want to miss on Empress, its really nicely done and very casual style. Most of the day I just hung out by the pool and listened to the live music, which was very relaxing. The band started playing at noon and into the afternoon. I took full advantage of my drink package today, and why not when you are on vacation. I forgot to mention they are now printing the drink package on the SeaPass card if you purchased it online. I suppose they made this change because the stickers would always rub off. Also noteworthy, I always saw open deck chairs, so no need to rush to the pool deck on Empress. Around 3PM, I noticed the ship starting to rock a little and noticed the clouds were turning darker. We were actually headed into a very large storm and heavy rain. The rain was coming in so hard I thought I was back in Florida. The pool deck cleared including myself and I decided it was time for a nap. Tonight, I decided to keep it casual and just eat in the Windjammer for dinner. I used my drink coupons at Schooner Bar and headed up to grab dinner. Perhaps I am very spoiled from the Windjammer on Brilliance of the Seas, but the options for food were very limited to what I have seen. That being said, the ship is not nearly full so I know they don’t want to waste a large amount of food. I decided to go with chicken tacos and just pretend I am at Sabor. I walked away from dinner just not very pleased, but I kept thinking about that steak at Chops. As far as the service in the Windjammer, it is the best I have ever seen, they always come around and bring you drinks and sometimes-even cookies! After dinner, I went to see the Battle of the Sexes game, which pits the men versus the women. I have never seen this show before and would compare it to a mini Quest in a way. I headed to the top deck for a while after the game to enjoy some open air and decided I would call it a night. Not a lot going on today, but no worries tomorrow is going to be action packed in Cozumel, Mexico. Today we are in Key West, Florida, which is our first port stop on this five-day cruise. I woke up this morning at 5:30AM, I do not know why, but I decided to enjoy the ship while I was awake. I went around many of the public areas and able to capture some great pictures without people in them. I will admit it was kind of weird at points feeling like you were the only person on this ship. I went into the Windjammer at 6AM when they opened. However, they only had breads and coffee available, no bacon until 7AM, bummer. I decided to head to the back of Boleros where they had that day one welcome party, to watch the sunrise. I ended up staying well over an hour just taking in the views; it was absolutely breathtaking to watch. I was able to see the local pilot board our ship to help us sail into Key West. For those wondering what that is, every port a cruise ship docks in, a local pilot boards the ship to help guide the captain to dock. They know the port and help provide the Captain some guidance along the way, however the Captain is still in control of the ship. Since the Empress has recently added these short sailings to fill time before Cuba, the main pier in Key West was already booked by Carnival. Today we docked at the United States Navy training facility. I actually thought were going to have to walk all the way into town and went back into my cabin to put tennis shoes on. However, once we got off they had rows of trolleys to take us into town. This was a different Key West experience and I really enjoyed the short 10-minute ride through the base and into town. They asked that we take no pictures of the base on our ride; so sorry I don’t have any. Once I got into town, my mission was simple find some Key Lime Pie! A few friends recommend I try Kermit’s pie, so off I went. The walk to their shop was very short, I just plugged it into my GPS, but it was around 2 blocks. When I arrived I noticed it was empty, but I guess that’s because it was 10AM. I went inside and ordered their classic Key Lime Pie, those wondering it cost $4.80. I’m not a huge sweets guy and it was early in the morning for pie, but it was amazing! The staff here was really nice too, they actually asked if I wanted a sample of their other pie. Who turns down free pie? They brought out a chocolate covered froze pie, which was also good but I preferred the classic version or maybe I was just too full. After, I headed to Sloppy Joe's for a beer. They did not have live music playing yet, so no real excitement there today on my visit. By this point it’s 11AM and I’m getting tired and decided to head back to the ship. Well what an adventure that was, since we took trolleys into town you had to take one back. Let’s just say I got on the wrong one, not once but twice. The second one was an actual tour of Key West, so off I went. They made a stop at Sloppy Joe's on the tour and I jumped off, and walked back to the bus area again. Now on my third try I asked the driver if we were headed to the ship, I can only laugh at myself on this one. I wanted to take a nap but they were running test on the ship, which caused them to turn off power (including air conditioning) for a half-hour, so off to the pool deck I went. Not really a big deal since there were very few people on board, but I did notice how the temperature rises quite fast without running air conditioning. I made some new friends in the hot tub and made good use of my select drink package. I went into Windjammer for a small lunch; I was still full from all that pie in Key West. The options today were not as great as yesterday, but I usually just get rice and fish anyways. Around 4PM I left the pool deck to get ready for the evening, still going with no nap. Right at 5PM, I went down to Schooner Bar and used my Crown and Anchor drink coupon and noticed the bar was full. This was the first time I’d seen it so full like this, but I don’t think I usually go around this hour. Almost everyone was using their 3 free drinks loaded on their card, since this is pretty much the only place to do so. Around 6PM I was starting to get hungry, my Chops dinner was not until 7:30 but I went early and they seated me right away. I was the only person in the restaurant when I arrived and there were 3 tables when I left. The service was outstanding and I got to know my waitress during the meal. I decided to order shrimp cocktail, mushroom soup (which I can’t decide if that’s better or French onion) and a salad to start (if you were counting that is three starters!). For my entree, I went with the 16oz New York Strip and let me tell you this was the largest steak I have ever seen. It was almost falling off the plate; once again the NY strip surprised me with how great it is compared to the filet. Which do I prefer? I am going to say I enjoy them both, but if you are really hungry, get the NY Strip. After dinner, I decided to go the headliner show in the main theater. I do not usually attend any shows unless I’m on an Oasis-class ship, but I wanted to try something new. We had Finish Henderson hosting the show. He sings all types of music and his voice sounded exactly like singer he was singing, no idea how he does it. I looked on his website looks like he is headed to Anthem of the Seas next, and Allure/Oasis this fall. If you get a chance, go to the show. He received a standing ovation at the end of the show for quite a while. Tonight is the white pool deck party; dancing under the stars they call it. It started raining and they moved it inside the Viking Crown lounge. I will say the event was packed, almost everyone wearing all white. I even saw a guy down their in his white crown and anchor robe, points for being creative. I stayed for an hour talked with the Cruise Director Elvis for a while really nice guy. Around midnight I called it a day, what a full day of events. Tomorrow we have our first sea day, and I’m really looking forward to it. Well, my cruise day finally arrived! I could not have been more excited to get back on Empress of the Seas. As I mentioned I flew in from Tampa, FL to Miami, FL today. The flight was on time and I landed in Miami at 8:30AM. With nothing else to do in Miami, I decided to head straight to the ship! I took an Uber ride from the airport to this ship. The ride was $15 and very easy process, pickup and drop-off were seamless. I had some friends getting off the Enchantment this morning so as my face was all smiles, theirs was no so much. I chatted with them for a bit and then headed over to my terminal. It was around 9:45AM and there were about 20 people in line to check-in. The security process does not open until 10AM, so we just waited in line until then. I checked in and their Loyalty Ambassador recognized me from a previous cruise and invited me into her suite lounge to wait. This was a very nice lounge with water, coffee, and small sandwiches. Another perk if you are in a suite, is this lounge you get to board first, she took us right on board at 11AM. Believe it or not, I was the first person to board Empress of the Seas today. Pretty cool experience, reminded me of being on board for a back-to-back. Once I was on board I headed straight to the Windjammer for lunch. I am going to make bold statement here, the mac-n cheese might have been the best I have ever tasted before, all I can say is wow! Lunch was outstanding and so fresh; I walked out with a smile that is for sure. Now that I had a full belly I had to put my Select Drink Package to work. I had pre-purchased the drink package online prior to Royal changing their new drink packages. This package only allows me to get beer and house wines. When I cruise alone this package works well for me, because I get my 3 free Diamond drinks at night between 5:30-8:30. I talked to new friends at the poolside bar until our cabins opened at 1PM. For this cruise, I am sailing in a standard ocean view cabin #7000. This cabin is all the way forward facing a little private walkway. I wanted to try a different cabin that faced forward. On larger ships having a cabin all the way forward might cause some long walks to and from the cabin, but on Empress it iss a very short walk. The cabin can sleep up to 4 adults, so if you notice from my pictures there are two beds that hang on the walls. These beds make it very difficult to get in and out of the bed from the sides, because you have to bend over. I have been getting in from the bottom of the bed, pretending I am a child again. 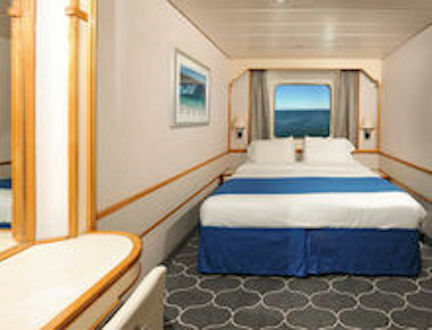 Other than the extras bed kind of in the way, the cabin is nice and everything on the inside feels new from her recent dry dock. The muster drill was at 3:30, and we set sail at 4:30. I have learned over the years not to arrive at the muster drills early, it can get hot standing on the side of the ship. Our drill was very fast and did not take more than 10 minutes. After the drill I headed up to the top deck and wanted to get a close look at the Enchantment of the Seas. She is my favorite ship and it was excited for me to see her again. But I do have a cruise on her next month. Once we set sail I headed to a top tier event for Diamond and up guest or suites. They usually host private events on Empress since there is no Diamond/Suite lounge. Tonight, I headed down to the Schooner bar to use my Diamond drink coupons, which are pre-loaded to my SeaPass card before dinner. I grabbed a window seat and just watched the ocean go by, that view just never gets old. I had made reservations for Chops Grill when I first got onboard for 7:30PM tonight. One of the Crown & Anchor benefits for Diamond Plus is a BOGO specialty restaurant. Since I am cruising along I paid the cover charge tonight $35 and tomorrow is free. The staff in Chops all remembered me from last month, so that was fun to see them again. I laughed because I ordered without even opening the menu. The restaurant was almost full, but do not feel like you need to reserve online before. I asked my waiter to speed the meal up because of Monday Night Football and since I was dining alone. Overall a great meal and I look forward to going back tomorrow night. Shortly after dinner I decided to get some rest, day 1 is always a long day and I was ready for bed. The ships does not feel full at all, there is never any wait at the bars. My Crown and Anchor VOOM coupon was not loaded, so I had to have them apply a manual credit. However, the VOOM is working great! The gift shop now has the ship models for $32.95. The air conditioning is now working in 90% of the casino. Stay tuned, tomorrow we are in beautiful Key West, Florida! If you have any questions, feel free to comment below and I will respond. Hi blog readers, its Michael Poole here and I’m headed back on board Empress of the Seas. If you recall, I was recently on Empress of the Seas July 28th and did a live blog on that sailing too. I enjoyed the ship so much, I’ve decided to head back and take you on another live blog adventure. This time I’m cruising solo, so I’ll be going in more detail of the Empress and all she has to offer. This cruise is a 5-day sailing, so one extra day than my last time on board. We are headed back to Key West, Florida on day two. Day three is a sea day, followed by Cozumel, Mexico and ending with another sea day. For my time in Key West, I’m sad to report there will be no bike tour this go around. I was thinking about all my recent visits to Key West and how I’ve never actually had in Key Lime pie there, so I’ll be on the search for some pie. In Cozumel, Mexico I’m thinking about just exploring around and see where I end up. I had thought about going back to Nachi, but I’m looking to explore and just see where I end up. When I originally booked this cruise, I booked the lowest cost cabin type, which was an inside on the lower decks. Over the course of a few weeks the cruise dropped a lot in price, since I was past final payment there is nothing you can do about the price. However, I was able to move up to an Ocean View cabin for no additional cost. Now I’ll be staying on Deck 7 forward, cabin #7000. This cabin over looks the secret walkway all the way forward, so I’ll be sure to include some pictures. My plan was to just drive to the port since I’m around 280 miles away from the port (4 hours). But after thinking about parking cost at the port $20/day puts me at $100 parking cost, plus fuel. So I ended up finding a flight for the same cost as parking and I’ll be flying in the morning of the cruise. I know that’s generally not a good plan, but worse case I’ll just jump in my car for a fast road trip. The final day of the cruise as already come, these shorter sailings go by so fast. Today we were docked in Key West, Florida from 7am-4:30pm. Whenever you leave the United States and come back you always have to enter customs, and this includes the port stop in Key West. This morning they had suite guests go through the process at 7am. The customs agents come on board the ship, this morning it was in the theater. You simply show them passports or birth certificate and on you go. This process doesn’t take very long, but my suggestion is just go early, regardless of what cabin you are in. This morning, we decided to get off at 10am; we were in no rush to get off. Most of the ship was actually already off and about. We did a little shopping at the pier, typical t-shirts and key lime pie shops. I did notice that most of the restaurants didn’t service food until noon, but they were all serving drinks. I didn’t have breakfast on board so I was ready to eat. We found a little pub that we had a pint at while we waited for Sloppy Joes to open. They opened up at noon and you really need to be there right when they open to grab a seat. I went with their famous sloppy joe’s sandwich and I’m glad I did, hands down the best one I’ve ever had. We enjoyed some live music and drinks before our excursion at 1:30pm. Today we had booked the bike tour through Royal Caribbean excursions desk. The tour started at 1:30pm and lasted until 4:30pm. We walked over to the bike shop, which is very close by, then geared us up. We visited a few places around Key West and our tour guide was very knowledgeable about the island. I learned a lot about Key West that I would have never known. About halfway through the tour we asked our tour guide if we could speed things up, as the heat was starting to get to all of us. We still went to all the locations, just didn’t stop at them to hear the history behind what we were seeing. As the tour was coming to an end, a member in our group had a minor accident on the bike. This took around a half hour to help them get a ride back to the ship, but it was 4:15pm and all on board was 4:30pm. By the time we made it back to the ship it was right at 4:30pm, and the ship was blowing the horn. We never really got worried about missing the ship because we had a Royal Caribbean excursion desk. So things do happen and sometimes knowing the ship will wait on you goes along way. Tonight our group had Chops Grill at 6:30pm for our last group dinner. Again, we had the select menu since we had over 20 people eating. I went with the NY strip for my main course and really enjoyed the steak. The service tonight was outstanding and they were always filling our water and wine glasses. If you happen to sail on Empress of the Seas, I highly recommend Chops Grill. After dinner we just explored the ship taking in the last few moment we have on board. I noticed that Guest Services had a rather large line, so try to take care of any issues you may have prior to the last few hours. There was a farewell show at 9pm, but we decided to pass on that and get some rest for our drive to Tampa in the morning. Voom on board comes and goes, you also have to sign in every time you use it. A/C in cabin works great, yes it’s hot during sailaway but it will cool down rather fast. Everything is new on board, from the sheets to the towels, pool towel, you can just tell it’s all very fresh. The food on board is outstanding, from windjammer to chops grill, it’s all outstanding. Cuban coffee shop never had cream for coffee, so I drank it without and enjoyed it. Crew on board is like family just after 4 days, really great job all around. Cruise Director Carlos does a great job and very personable if you get a chance to talk to him. Today was our first sea day on board Empress of the Seas and once again I woke up at 6:30am to check out the sunrise. I headed up to the pool deck just in time to catch the sun coming up, once again wow. For top tier Crown and Anchor members (Diamond Plus/Pinnacle) and those staying in suite you can enjoy breakfast in Chops Grill. They offer made to order eggs, omelets, and fresh fruit bar. 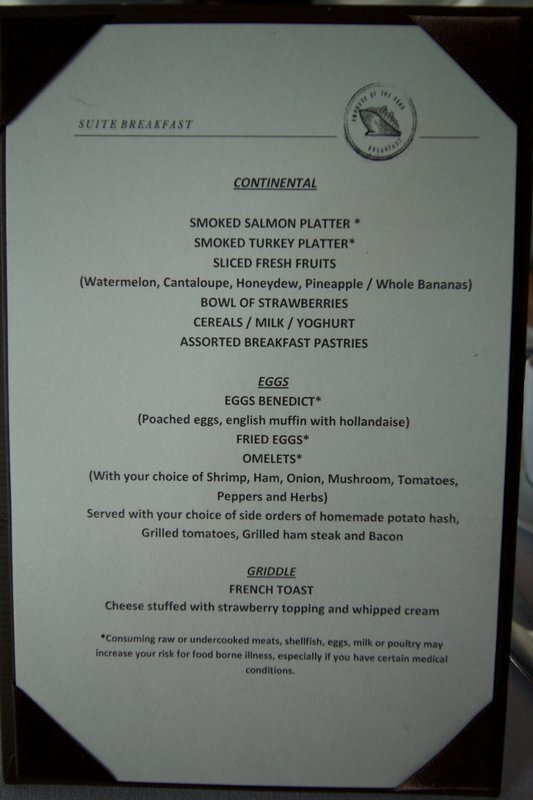 The breakfast is very similar what you would find in the main dining room on any Royal Caribbean ship. The real advantage is fast service and we were the only ones in there at 8am when they opened. I went with the basic Ham and Cheese omelet and I really enjoyed it. By now the staff in Chops Grill are starting to feel like family, it seems I’m starting to have most meals in here. After breakfast, I headed out the pool deck to soak up some sun rays while my girlfriend enjoy her spa morning. My gift to her for letting me live blog, Periscope, take endless pictures was to treat her to a spa treatment. She gave very positive feedback on the spa and it sounds like she is hooked for future cruises, oh no what have I done?! Okay, back to the pool deck… This morning from 9:00am-10:30am they had a helicopter flying over us, beside us, and around us filming. Many guest were asking staff what was going on, but I knew they were filming the brand new Empress of the Seas. Okay now I feel like all I am blogging about is food, but that’s all you really want to hear about Anyways, right? Well today they had their famous “Sunday Brunch” in the main dining room. Every sea day on Empress of the Seas, they have a big brunch from 11am-1pm in the dining room. They had a large variety of breakfast and lunch options, so no matter what you were in the mood for they had it. During the Empress brunch, they also serve bottomless mimosas and Bloody Mary’s. After our brunch, we decided to head back to pool deck and it was very full. Since Empress of the Seas has just one pool it can get very packed, but I never had a problem finding a deck chair. We lounged in the water for quite sometime with the Caribbean band playing music. Pretty typical sea day with games around the pool deck and everyone enjoying themselves. I did notice they were selling the beer coolers at the bar, so if you don’t have a drink package this is a great value. At 3:45pm we had a bridge tour for the Crown and Anchor group. We met on deck 9 forward and were greeted by security and did metal detector scans on us before we went into the bridge. Once we were on the bridge they did a quick talk about what their roles are on the bridge. We were aloud to take pictures of everything, just no video. Tonight we were headed back to Chops Grill, again. We are feeling like family in here, but it was a great experience. We requested our waiter from night one and he took great care of us. I went with shrimp cocktail, which might be the largest shrimp I’ve ever seen. Followed by the mushroom soup and 9oz filet. We were dining at 6pm tonight so the restaurant only had a few tables eating and the service was extremely fast. Tonight was the white pool deck party, if you are coming on board Empress you should plan on packing white attire, though it’s not required. Many guests, including myself were not in white. That’s a wrap on day 3, stay tuned because tomorrow we are headed to Key West, Florida! Today we spent the day in Coco Cay, and if you have ever read any of my past live blog’s this is my favorite place to visit in the Caribbean. I like Coco Cay because it’s very peaceful and such a relaxing day. This morning, I woke up at 6:00am and decided to go explore the ship and take some photos. I know I’m on vacation and waking up before the sunrises. I really enjoyed the sunrise and if you haven’t woke up early on a cruise before I really recommend it. At 7:00am we had scheduled to have room service delivered to our cabin. The fruit was very fresh and by far the best scrambled eggs I’ve ever had on board any cruise. They have breakfast cards behind the cabin door you fill out and place on the outside door handle the night before with your order. We had a large group scheduled to take the first tender boat over to Coco Cay at 8:15am. We met at the Schooner bar and were quickly walked to the tender. The ride over to Coco Cay is 5 minutes and it’s really a great time to take some ship photos. Once we arrived in Coco Cay we headed over to the Cabana area. These Cabanas are available to rent for the day at $250 and you can bring up to six guests. When we arrived they had large Evian water chilled for us and beach towels. This was my first time in the Cabana area and I was very surprised how nice the experience was. At 11:30am, they had a special lunch for us in the cabana area and it was an upgrade from the standard lunch they serve. They had salmon, shrimp, salads, and trays of endless fruit. This afternoon we had planned to snorkel, in all my trips to Coco Cay I’ve never snorkeled here. We were treated to some very nice snorkel gear and the staff assisted us putting it all on. Our group was 8 people and we headed out to a see the ship and plane wreck. The tour lasted an hour and was very entertaining if you enjoy snorkeling. After an hour of snorkeling I helped the production team film a spot with my snorkeling equipment. They have a full team traveling with us doing all kind of shoots of Empress and Coco Cay. After filming we decided to head back to the Cabana. By this point in the afternoon most everyone had headed back to the ship so we enjoyed some relaxing time on the island before heading back. So right away I noticed things seem different in Coco Cay today. I noticed the map they gave us had sites that said closed for remodel, which I thought was strange. However, once I got on to the island I could quickly tell what they are adding, in the water cabanas like Labadee. It looks like they just recently started construction on them; it is the second cove when you enter Coco Cay. Also, they have a new bar in Coco Cay and its out in the ocean. This bar actually floats out in the water, meaning you have to literally swim out to the bar. This was added around two weeks ago the staff said and it is located right where the South Beach / barefoot beach sign used to be. Royal Caribbean continues to push the limit, and here is another perfect example. This afternoon was very relaxing on board; honestly I think most people were taking naps. I decided to go have some of their famous Cuban coffee. They open at 7am and stay open throughout the day. With our drink package, the coffee is included so didn’t have to worry about paying here. I usually just go for the standard black coffee, but they do not carry cream here so it was all black and strong which is what I needed anyway. We moved on to the shops and they were having their $10 table sales, buy 4 get the 5th on free. I ended up getting my blue coffee mug and a T shirt, however they do not sell ship models yet, which is a bummer. Tonight we decided to enjoy dinner in Chops Grill, again. This time was going to be different since it is just the two of us. The steakhouse was packed tonight, almost every table was occupied, so the service was not like the night before. I went with the steak, onion soup, and bacon. The meal was outstanding; again a perfect steak and I ate every bite. However, our service was less than what you could expect, our waiter as serving the Captain’s table. The headwaiter noticed we had empty water and wine glasses and actually invited us back tomorrow on him! Outstanding service by Royal Caribbean once again, they know we left there with a less that perfect experience and want us to come back on them. I did use my Diamond Plus coupon valid night 1 or 2 and its buy one get one cover charge free, so I paid $35 for both of us. After dinner we decided to call it a night, that is right... we were in bed before 10pm. We had a really long day and the sun drained us so a good night sleep was calling our name.